Last week I wrote about how much I like a traditional tailvise and I got some requests for details. "You mentioned that your mechanism is wood." I need to clarify this. The vise is wood - it runs in a wooden track. But the screw is a regular steel vise screw. There are other designs for tailvises afloat that use a steel plate as a guide but I never seriously considered approach because I didn't like the idea that the work could get dinged against the steel. Not sure if it's a real issue and since I don't plan on building another bench soon I doubt I will ever found out. The Lee Valley tail vise is metal but it is mounted under the bench and won't contact the work. Since I haven't used either of these vises I don't know if they have any practical advantage over my vise. However that my argument is for a tailvise, not for any specific tailvise mechanism. I don't know enough about the nuances of different mechanisms to comment. My vise does sag a little. It's not wear - it's imprecise construction. I figured this out about a day after I finished the vise and I promised myself I would fix it right away. But the vise works great, sag hasn't been an issue, so don't hold your breath for a fix. 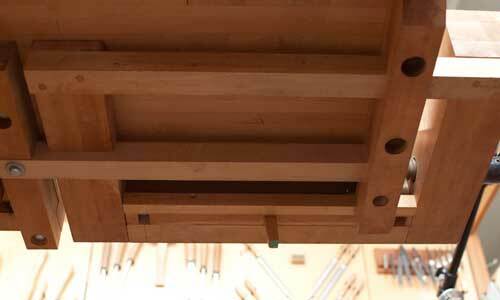 You can see in the picture of the underside of the vise that it's basically a rectangle dovetailed together. The point of the "L" and the rectangular construction is to prevent wracking - which it does. One reason you need to design for wracking is that the lead screw for the vise isn't in line with the center of the jaws. This is a real advantage because I have a row of dog holes going through the center of the tailvise, which makes for very even clamping of boards over eight and a half feet long ( more than a foot longer than the seven foot bench) And this vise develops enormous pressure. I can't think of any other reason for the "L" although having a wider surface at the end of the bench is a nice thing because as the vise opens you have more a surface for resting stuff on. I built the Klausz bench and refinished and trued it up a year ago. My tail vise had a small sag which was fixed by a shim. It's nice to have the whole top flat and on the same level. A couple of things have improved its usefulness. I lined the jaw meeting faces with masonite, rough side out. Workpieces are held in a much better grip than before (thanks, Ron Brese, for the tip). I made wooden bench dogs for each dog hole. This is really living, now! Finally, I personally love the bench looking clean and free of spots. Another workbench handles rough objects, stains, and glue, but my primary hand tool bench looks so great and inspires me when I craft objects on it. This is great Joel, I think I will think over my next bench design to incorporate a tail vise!! The sag, over time, that's often reported with tail vises is the result of the cantilever of the section supporting the tail vise. If the leg set is modified so that the rear legs are under the end of the bench this can be eliminated. 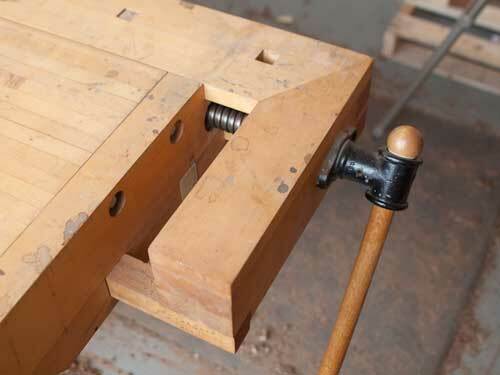 To be effective the location of the stretcher between the legs at the front needs to be moved back to be just below the bench portion that adjoins the tail vise. This allows clamping stock vertically without interference from the stretcher. Nice bench and tail. I read Krenov years ago and he had said the first thing you should do is build a bench. So after 30 years of construction and carpentry I finally did just that. Being in the dark about benches and most things, the story of my life, I jumped in. Read this and that but mostly I just said to myself, what do you want it to do ? Came together pretty good. I used an old wood screw and nut I picked up for $20 and built the tail vise around it. I wondered when I was rebuilding the screw what it had been used for in it's past life. Who handled it and the thoughts that passed through and around it's threads on their way each to a completed task. For me it's my tail vise now. And I love it. Larry Williams, your point is well taken. I just was looking at the leg placement on my bench and it appears that it would be improved by having the base extend closer to the tail vice. It would land perfectly between two bench dog holes. I wonder what Frank Klausz would have to say about it. This classic bench has so many well thought-out features based on the hand tool working experiences of generations of craftsman, that there would probably be an important reason for it being the way it is. 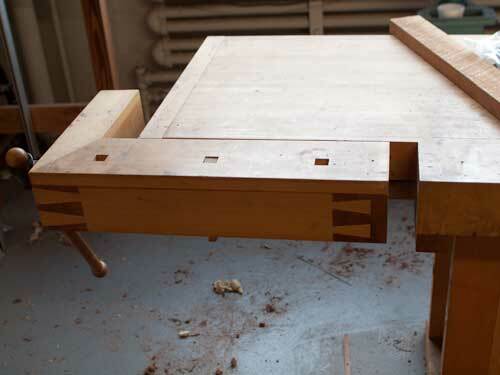 You want to use the bench above where it is supported by the leg for heavy chopping, so perhaps that's the reason, giving some distance away from the leg vice opening for boards to lie on and be clamped. How about chopping and heavy pounding? Do you find that it's not an issue with the unsupported top over the longer span? I doubt many people pound on their bench as much as my former partner did when he completely chopped bench plane escapements by hand. The benches did just fine under that punishment. Would you happen to have a shot of the tail vise from the other side of the bench so that I can better understand what you are describing? Thanks. Do you know of any plans for building a tail vise w/ a wood screw. It doesn't seem like Klaus' design would work well w/ a wood screw. It would have to be too wide. Hey Joel, in response to Steve(01-03-2011 above), 18 or so years ago I made a bench with the top exactly as in the Klaus design, except longer (87")and wider (26 1/2" with about 36" including face vise), with hand turned wood screws on both face and tail vise. I made it portable with wedged tenons to hold the base rigid, and have had absolutely no problems with sagging or racking at any time. I take it apart and transport it 2-3 times a year for 3-4 days outdoors (I do a cabinet maker / joiner impression as a Civil War re-enactor).